Are you ready for fall baking? Cinnamon Apple Crumb Cake is the perfect dessert for crisp weather coming up, just like this Caramel Apple Cinnamon Roll Lasagna. 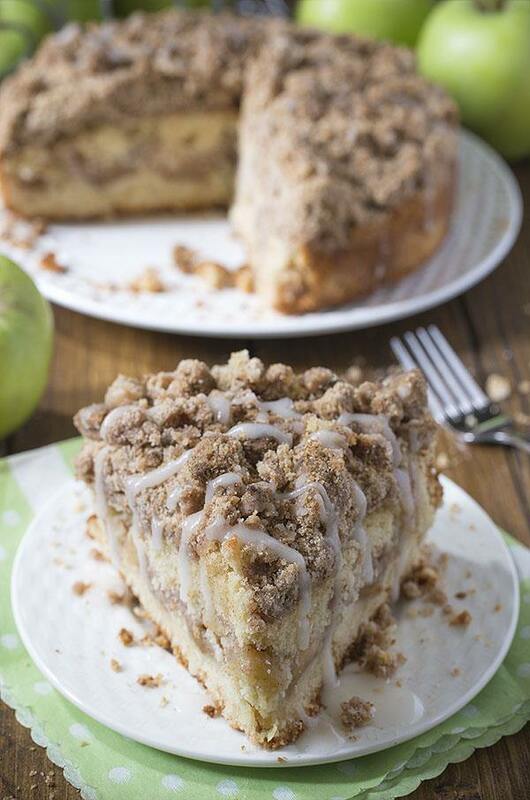 But, if you are not a big fan of pumpkin treat, then you must try this coffee cake loaded with apples and crunchy brown sugar-cinnamon streusel crumbs, drizzled with apple cider glaze. Being a food blogger is not such a simple thing as many of my friends think it is. This time I’m not talking about the usual problems that happen in the kitchen like an unsuccessful frosting of a perfectly backed cupcake or the filling is thin for the 1000. time even though you did everything by the book. 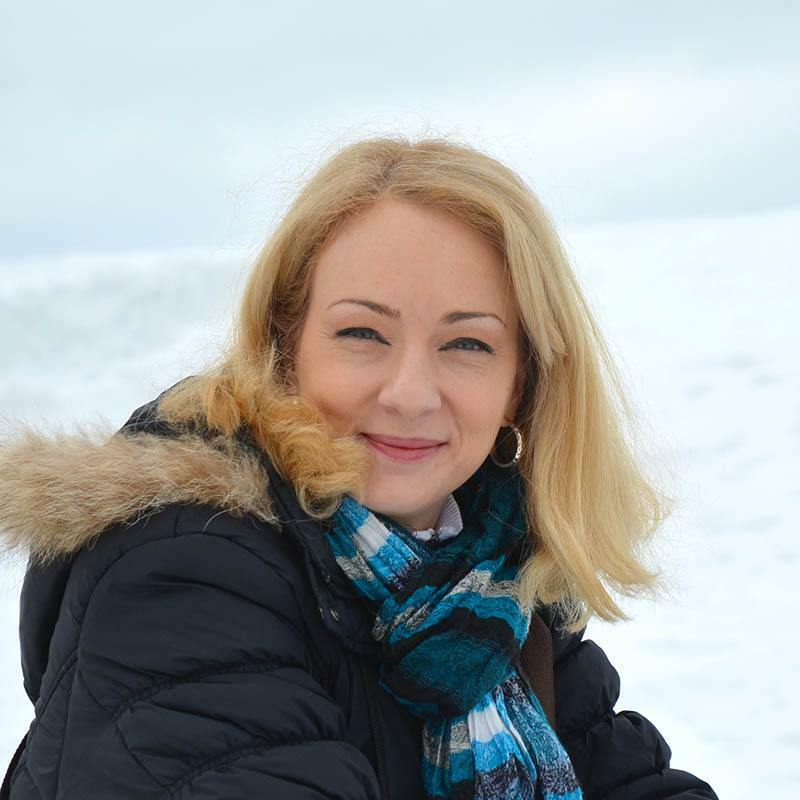 A few days ago, answering the phone, I heard my best friend: “Vera, when do you have time for me? I have something very important to tell you! I’ll be there in a few hours. And please, make one of your sweet desserts so we could eat something sweet while talking”. And – click, that was it. If I had the phone number, I would surely have called Superman because I knew what was coming to me! First, searching on Pinterest. Cheesecake, Cupcakes, Cookies?Nooo, maybe this quick Poke Cake? Hmmm these Apple Muffins look fantastic, too. After an “easy” 45 minutes, the decision was made – Cinnamon Apple Crumb Cake! And even though it all looks so simple, there are a few completely logical questions: “Have I used all the apples on Apple Cookies?”. Of course, then I had to spend 30 minutes in the shop for buying a few apples. After two hours, luckily without any new problems, Apple Crumb Cake began to spread it’s smell through my home, and I remembered my blog. 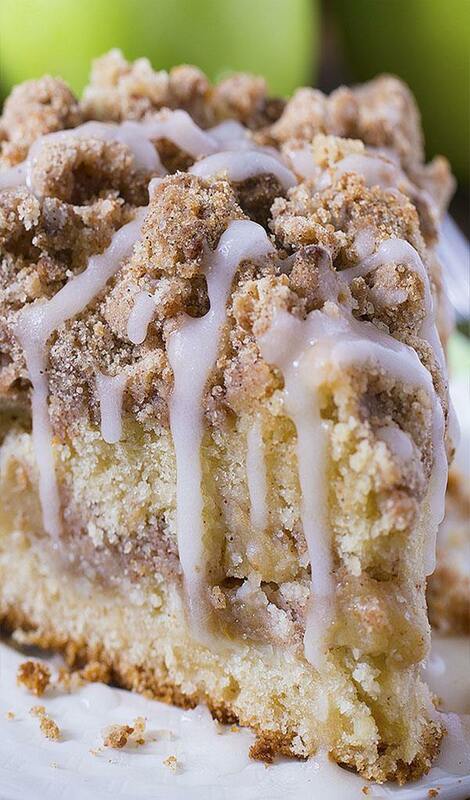 Well, it wouldn’t be bad to make a photo of this beautiful coffee cake. And of course, as is common in situations like this, the display was showing the (in)famous message “Change the battery”. 30 more minutes for charging the battery and as soon as the photo session was over, I got the SMS “I’m coming in 20 minutes”. Just enough for washing the dishes, too. And so, 30 minutes later, talking about the newest gossip and enjoying the Cinnamon Apple Crumb Cake, came the usual “Vera, you really are a genius. Only you can make such a sweet cake without any problems. You have to give me the secret one day”. 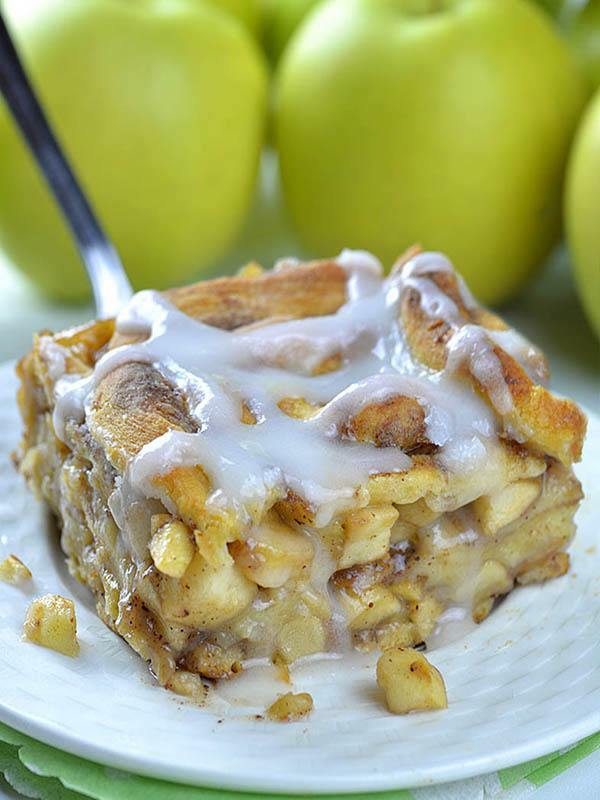 Caramel Apple Cinnamon Roll Lasagna is fun and delicious combo of classic caramel apple pie and yummy cinnamon rolls. This awesome fall treat is delicious dessert, but it is great idea for easy breakfast casserole, too. 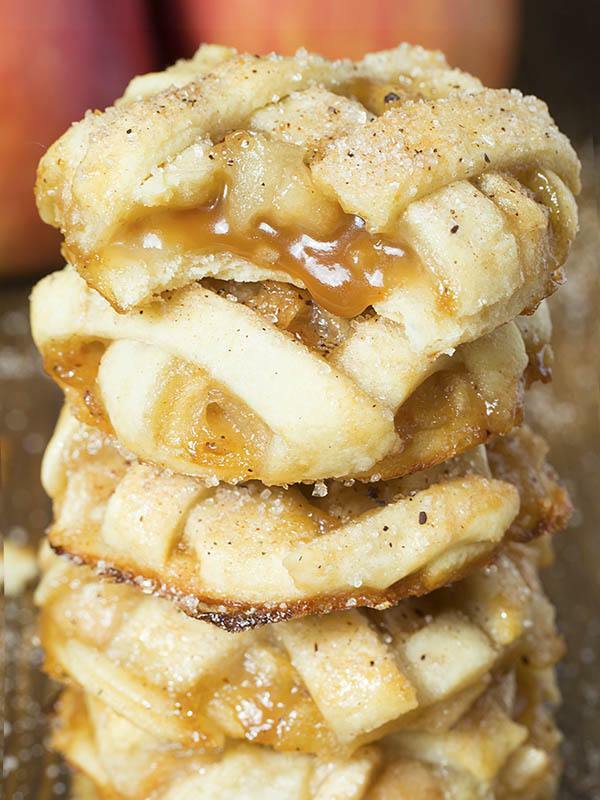 Apple Pie Cookies – sticky and chewy, bite sized caramel apple pies. 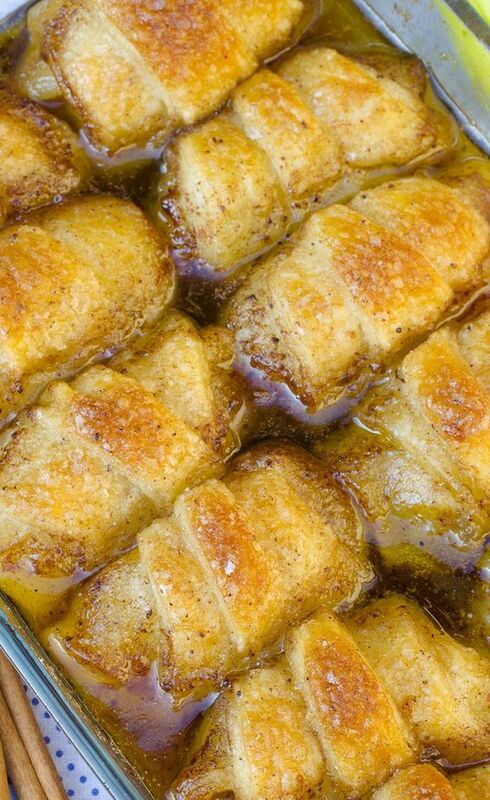 These warm and comforting Apple Dumplings are incredible by themselves or served with ice cream. Are you ready for fall baking? 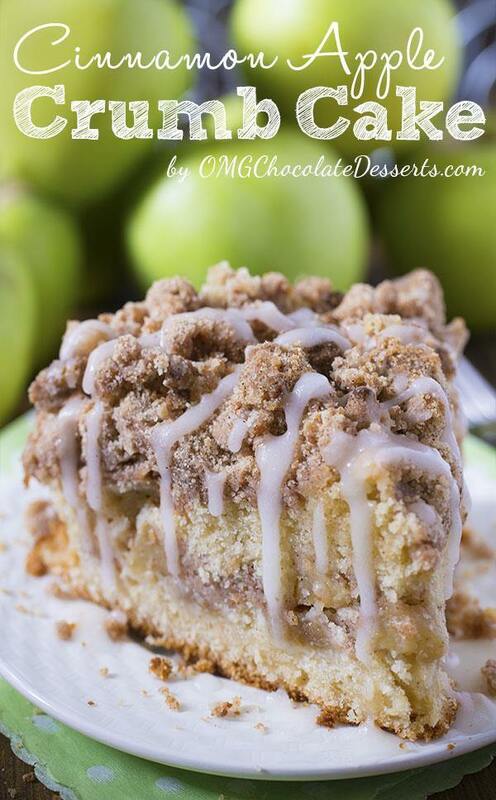 Cinnamon Apple Crumb Cake is the perfect dessert for crisp weather coming up. Preheat the oven to 350 F. Grease 8 inch springform pan and line the bottom with parchment paper, set aside. To make cinnamon streusel crumb, first in a bowl, whisk together dry ingredient. Then add melted butter and vanilla and stir until the mixture is evenly moist, set aside, too. To make the cake in a large bowl, cream together 4 tbsp butter with 1/2 cup sugar until light and fluffy, then add egg and beat well. Finally, add vanilla and sour cream and beat again. In another bowl, stir together 1 cup flour, baking soda, salt, and baking powder and add to the butter mixture, stir until just combined. Spread half the batter at the bottom of the pan ( it will be very thin layer). Spread the apple chunks evenly over the batter, then sprinkle about 1 cup of the cinnamon streusel crumbs over the apples. Spread the remaining batter over the crumbs and on top spread the rest of the cinnamon streusel. Bake 35-40 minutes or until a tester inserted in the center comes out clean. Before remove the ring of springform pan run a thin knife around the cake. To make the glaze, whisk together powdered sugar with apple cider and drizzle over the cake. Does this need refrigerated when saving or can in be left out? I leave mine on the counter in a covered glass cake dish. I have a problem with cinnamon streusel crumb. How many grams is 1 cup? AWESOME !!! & EASY! !! Apple cider vintager for the strudel ? Hi Nikki, it’s apple cider juice. Thank yiou! This was my question also, sounds yummy! Do you think I could substitute plain Greek yogurt for the sour cream? What can I use if I don’t have sour cream or yogurt. I have cream cheese?? Hi Yvonne, sour cream or yogurt soul give it moisture. Cream cheese is not good idea. This may be a dumb question, but will this cake be fine in a regular cake pan or a baking dish? Hi Nicole, you can use other dish. What other kind of dish or pans could you use. looks great on Pinterest but SOOOOO Many Ads popping up I can’t read the recipe! I can Barely write this. Interrupted 8 times iN 3 lines by ads! Holy cow! Does this need refrigerated or can it be left out? You don’t have to refrigerate it for day or two, but for longer storage I suggest to place it in the fridge. We have have an apple tree in our yard and have a bumper crop this year . I made this today and it was awesome !!! Anyone else have trouble getting this to cook through in the center? Used an 8″ springform as suggested. I had to bake for an extra 35 minutes… It’s still too hot to take out of the spring form yet, so I won’t know how evenly it’s cooked for a couple of hours. I think it’s just that I’m at a higher elevation though… 🤞🤞🤞 for it though! It still smells AMAZING! Would use suggest a 9×13 or 8×8 pan? Hi Holly, use 8×8 inch pan if you don’t have 8 or 9 inch springform pan. I just made this and we loved it. Wondering if I can make ahead and freeze for the holidays? Yes, this freezes well! I took this to work on Friday (it’s my office’s favorite). We couldn’t eat it all so I froze the remainder. It was great many weeks later! This is currently in the oven 🙂 can’t wait to see how it turns out! One question: has anyone tried making this with twice as much cake batter? It was fairly difficult to spread the bottom layer of batter as well as the middle layer, and I think doubling the amount of batter might just do the trick. I just had the same issue. I doubled the batter and it’s going 20 minutes past the bake time now; probably needs additional time, too. I found the same…Very hard to spread. The cake tasted great but was very thin. Is that the way it’s suppose to be. I thought it would be higher adding the baking pwd. but it wasn’t. If you keep dipping your knife in a cup of hot water it will be easier to spread. Hi! i wanna ask about the flour. Do we use all purpose flour? or cake flour? Hi Regina, use all-purpose flour. Any time a recipe calls for flour – PLUS baking soda, baking powder and salt, that means use plain flour. Self-rising already has these additives. Can I substitute the sour cream with something non dairy? Like maybe applesauce? Hi Amy, sorry but I can’t help you with that, I tried only like it said in the recipe. this is for Amy’s question about non-dairy ingredient. I substitute Greek Yogurt but don’t know your reason for substitute. This was the best cake in the world! The only things I added was I used 2 large apples (an apple per layer, because I can’t get enough apples!) and I made this cinnamon brown sugar glaze thing by melting 4 tbs of butter and adding the brown sugar and cinnamon to my liking. I just spread this mixture on top of the batter for each layer before adding the apples and crumbs. I found that this helped with spreading the top layer. Also, I added about 1/4-1/2 a cup of buttermilk because I thought my batter looked a bit dry. The batter was a bit thick and dry. Hard to spread. It was almost like it needed a bit of milk added. Sorry but won’t be back to try this or any recipes because of all the ads. I know you make a living from it but such intrusive ads covering the page with no way to stop them have to be hurting your bottom line. Super simple to make and smells heavenly as it bakes. Great texture and flavor. 5 stars! It was very fun to make and is in the oven right now! I’m excited to see how it turns out! Can you do something different for the glaze? Can you do something without the apple cider? This cake was amazing! I took the advice of someone below who said to put more apples (almost one on each layer) and a cinnamon, Sugar, and butter drizzle on each layer (4T butter, 1/3 cup brown sugar, and 1/2 t cinnamon), and double the batter or it won’t be enough to spread. I actually tripled the recipe for a 9×13 pan. It makes a big cake but that’s how we like it at my house. It cooked for almost an hour and a half. Amazing! Make this cake! Thanks for sharing the recipe. This was one of the best coffee cakes I have made in a long time.Definitely a keeper! Thanks for sharing! Hello, I was wondering if I could use a 9 inch springform pan instead of an 8 inch? How much would it change the baking time ? Hi Shane, you won’t have enough batter for 9 inch pan. I only have 9 inch spring form pans. Would a 8 inch cake pan work instead? I made this cake at the weekend and my husband said its the best cake ever, and my family who were visiting also loved it. Will be making many more times in the future. Highly recommend this recipe. This looks delicious! Any tips or suggestions for baking it at high altitude (7,200 feet)? I haven’t tried baking anything since I moved from sea level! Hi Emma, I’m sorry I can’t help you with that. Thanks for the recipe! I made the cake yesterday in a 9 inch pan and baked 20 minutes overtime, and still the middle wasn’t completely set. I made it with 1 apple and 1 pear, but would also suggest using at least double the amount of fruits, because the batter is quite thick. Can you use 2 8inch round pans? Made it today. DELICIOUS! I used low fat plain Greek yogurt instead of sour cream. No apple cider, so mixed topping with almond extract and added sliced almonds on top. Will be making this again! Also, doubled the batch and baked it in 8″ square pans. Do i need to cook apples first ? No, you don’t need to cook them. I just ordered an 8in spring form pan from Amazon this morning to be able to make this cake over the weekend for my family. I’m concerned about all of the comments saying to double the recipe, and to add more fruit.. I made this the other day and it was delicious! I have to agree, that it was the best coffee cake that I have had in a long time. Can’t wait to make it again, but next time I will double the cake recipe, just so we can have more of it! how do you get the parchment paper off the bottom of the cake? might be dumb question lol. can i just use a disposable pan instead with no parchment paper? Hi Stephanie, I thing you could use it. About the parchment paper, when you take off the ring from springform pan just lift a little one edge of the cake and pull down the paper, it will peel off easily and the cake is very dense so it won’t pull apart while you do that. I made this for the family today and it was fabulous! All four tasters gave it 5 dessert spoons! I even allowed seconds on dessert! I only had a 9 inch springform and substituted milk when I had no apple cider, but it was still great. I will get cider next time, because I will definitely make this again! I’ve been so excited to make this and have a fresh bag of apples I picked with my boys over the weekend. Just pulled out the springform and it’s 10″, not 8″. It’ll need more batter, I’m sure… Do you think I should double or triple the batter? I made this last night and it was a hit! I actually used a 9 Inch springform pan and it worked fine. The layer on the bottom was thin but everyone thought it was great. Didn’t even think to measure the pan. The batter was thick but I spread it with a knife and did great. Can’t wait to make again. Thanks! 1. Värm ugnen till 176 grader. Smörj den löstagbara kanten på en 20 cm bred form och spänn fast ett smörpapper på botten. 2. För strösselsmulet: blanda ihop de torra ingredienserna först, lägg sedan i det smälta smöret och vaniljsockret och blanda tills blandningen är jämnt fuktig. 3. För kakan: vräk samman smör och och socker luftigt, tillägg ägg och vispa, därefter vaniljsocker och gräddfil och vispa igen. 4. I en annan skål, vräk samman 2,5 dl mjöl, bikarbonat, salt och bakpulver och lägg i smörblandningen, blanda tills det är jämnt blandat. 5. Bred ut halva smeten över formens botten (det blir ett tunt lager). Fördela äppelbitarna jämnt över smeten, strössla därefter 2.5 dl av kanelströsselsmulet över äpplena. Bred slutligen ut den återstående smeten över strösslet och ovanpå denna sista smet, krön verket med kvarstoden strösselsmul. 6. Skjutsa in i ugnen 35-40 minuter, eller testa med en sticka och se om den är ren. 7. Innan du befriar kakan från formen, för en vass kniv längs kanten. 8. Vispa samman äppelcider och florsocker för att skapa glasyren, vilken du sedan låter rinna över den ångande kakan. I used apple sauce instead of sour cream, and this beautiful cake turned out perfectly! This better taste good because it’s a lot of work! How do you get the second layer of batter over the apple and streusel mixture? I made this amazing cake. It was very delicious. My five children and I enjoyed it emensly. Loved it !!!!!! What size springform pan do you need to make this or does it not matter? Can I make it in cupcake pans for individual crumb cakes? Hi Gail, you can make it as cupcakes. I’ve made this twice now, and it was perfect both times! The first time I did it in a 9 inch springform pan. I had to bake it 45-50 minutes until it felt done in the center. The second time I doubled the recipe and made it in a 9×13 pan, and didn’t line with parchment paper. It was a lot easier to spread the first layer of batter, and it didn’t stick at all. It took about an hour to bake in the 9×13 pan. I also used a bit more apple the second time, and put some on the top layer as well. This is a serious crowd pleaser! Thank you for this delicious recipe! Thanks Jen 🙂 I’m really happy to hear that! Can I bake it on a 9×5 loaf pan? I really want to do this but I only have a 9″ inches springform pan. Hi Adriana, I don’t know about the loaf pan, but you could make 1 1/2 recipe and bake in 9 inch springform pan. Hi! I am thinking about making this for a bridesmaid luncheon, but that would mean it wouldn’t be warm because I would need to make it a day early! Is it still just as good room temp? I feel like apple cinnamon stuff is better warm! Thanks! Hi Ashley, it’s great the next day,too. You could keep it room temperature, and maybe make the glaze the day you’ll serve it. Its Thanksgiving morning and I have this in the oven now. All the individual parts taste amazing, so I am sure it will be scrumptious! Next time though, I would double the cake batter, it was tough to spread such a small amount on the pan, and even tougher to spread the top layer though. But I followed the recipe to a T. Can’t wait to try it!! I’ve made this a few times and I just have to tell you how amazing it is!! I followed the recipe exactly the first time and it was so delicious, but since then I started adding more apples (1.5 large or 3 small) and did a caramel drizzle instead of the apple cider glaze. Forgot to line the bottom with parchment paper, will it still come out alright? My batter came out thick & hard to spread especially on top. Is that normal? I hope it will be as yummy as it looks but I had a very hard time spreading the batter, especially over the apple layer, as the batter was so thick. I ended up just dropping spoonfuls on top and hoping it all works out. Smells great in the oven! Well, despite how hard it was to spread the batter, this was amazing. Took it to a meetup with some friends and all New Years resolutions were cast aside! Absolutely delicious and I will definitely put this in the dessert rotation. Sounds delicious. I have to try it. Hi Katia, I’m sorry it didn’t work out. Made this tonight! It was Delish!!! This looks absolutely devine. I can’t wait to try it. Thank you for sharing. Are you referring to Apple cider vinegar for the glaze?? Hi Sarah, you can use apple juice. I just want to say how delicious this turned out. I had no issues and it was a hit with my family! Great recipe, the bread turned out amazing! Definitely a recipe I will make again! Can I use a 9in bundt pan for this recipe? If not I have an 8×8 pan or would it work in an 8×11 dish? Hi Meredith, try 8×8 inch pan, you won’t have enough batter for 8×11″ dish. Will a 9″ spring form work? Is it possible to add 1/3 to the recipe? Hi Donna,you can use it but it’s easier to serve when it’s baked in springform pan. If use 8 inch round pan it must be deep to have enough volume. Very delicious recipe! As many have commented, the batter is very thick and challenging to spread. On my second try, I made a few changes: I increased all the ingredients by 50% and baked in a 9″ spring form at 350 on the middle rack for 60 minutes and it came out perfect. With the additional batter, spreading was much easier. I’d suggest at least 50% of the batter at the bottom and don’t forget the parchment paper as it helps reduce burning of the bottom. Thanks very much Vera! This was absolutely delicious! I took advice from some of the previous comments and I am glad that I did. I increased each ingredient amount by 50% (example:1 cup=1 & 1/2 cups) for the cake batter using a 9′ inch springform pan and it was perfect. This was such a huge hit with my family and I will definitely be making this again. Thanks!! Great coffe cake! Loved it! I’m from Brazil and I would like to do this cake today or maybe tomorrow, but we don’t have sour cream here. So, I was wondering if I can replace it for some other igredient? Maybe yogurt? Do you have any suggestions for me? I will be attempting this damn recipe for the third time today. First time I dropped the pan right as it was about to go in the oven. Second time, I didn’t have enough batter for the top layer. This time I am tripling the batter, and its going to work or I am shoving myself down the garbage disposal! Third time was a charm! I used a 9 inch springform pan, and tripled the batter (though I did not use all of it). I had to bake it about an hour and fifteen minutes (I’m high altitude though, and did not adjust the temperature, so YMMV). Thanks for the recipe! This was delicious! Followed the recipe exactly and didn’t have any issues with the amount of batter. I used a small offset spatula and put the batter on in spoonfuls all over the pan which makes it easier to spread. Will make3 this again and again. Thanks so much Barbara! I’glad to hear that! This is one of my go-to recipes. Always a hit. I use 2 to 3 apples. Amazing. Will be making this tomorrow for National Night Out. I went to the original recipe and am going to be using a 9 X 13 pan to bake this in. I have a spring form pan but I need at least 12 – 15 slices. Will let you know how it came out. Thanks for sharing! How far ahead of time can I make it? Absolutely fabulous!! Doubled the crumbs, tripled the batter and subbed ripe pears for apples. I folded the fruit into the dough. Baked in a 13×9 springform pan for 45 minutes couldn’t have turned out better. Will definitely be making this one again. This recipe is great! I invited friends over for coffee and dessert. This apple crumb cake did not last more then 20 mins. I would however make an extra layer next time to make it thicker. Thanks Amanda 🙂 I’m so happy to hear that! I substituted gluten free flour and added 1/4 tsp xanthum gum. It came out so great, really delicious. I highly recommend this recipe. For the glaze-is that regular apple cider or apple cider vinegar? Hi Christi, it’s regular apple cider. Awesome Crumb Cake Recipe! 🙂 Thank you Vera! I made this today. It was awful. So disappointed. Hello. I was wondering if you could answer a few questions I have about this recipie. Do you have any expirience cooking this cake in a convection oven? Mine doesn’t have an option to turn the fan off and I wantes to know how it would effect the cooking temperature and time. Also for how many days does this cake stay fresh if kept in refrigerator? Lastly, if I’d want to serve this cake hot but at the same time make it ahead of time what would be the best temeperature and time to reheat it at? Hi Laura, i think you should preheat the oven to 350 F, and reduce the temp to 325 F when place the cake in the oven. Start checking if it’s done after 28-30 minutes. Maybe you’ll need to tent the top with aluminum foil if it starts browning too much. Prepare the cake trough step 6. Cool completely, cover the cake tightly and refrigerate for up to 2 days or freeze up to 3 months. Bring the cake to room temperature, add glaze and serve. I haven’t tried to reheat it. Maybe you could reheat it at 210-220 F maximum, wrapped in aluminum foil, for about 20 minutes,but I’m not completely sure about this. I’ve made this cake 4 times now and everyone loves it! The first time I didnt have a fresh apple handy so substituted unsweetened applesauce. Turned out great! The last two times I’ve baked it in a 9 muffin tin (larger than cupcakes) using cupcake liners. Worked perfectly and gives us one more serving than my spring form pan. I just want to say it looks so delicious i will make for my family! This is the second recipe I’ve made off your blog in 3 days and it is fantastic!!! I only have a 9 inch spring form pan, so I doubled the recipe and had no issues. Took 45 mins to bake. I’m thinking I’m going to spend the next few months baking through your blog! All of your pictures look great, and they catch my eye, which is why I tried the recipes! !